A bird’s eye view (left) shows that the playground’s outline takes the form of a stylized salamander—hence, the name. Two black climbing rocks serve as the amphibian’s eyes and four play zones are housed in the front and rear footprints. The playground pays tribute to the blue spotted salamander, a species native to Montreal that finds some respite in this green urban oasis, where it is protected. The equipment here is atypical. If it doesn’t require flash-of-fun, kid-powered motion, then kids have to scrabble over, through, or around it. 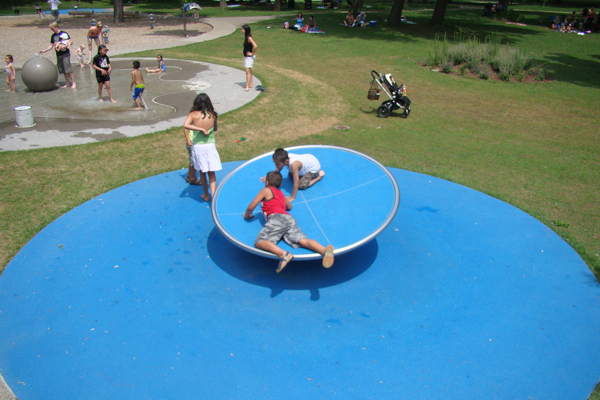 In comparison with the riotous colors of the 1960s-era playspace that preceded it, Salamander Playground is a study in muted, minimalist tones of silver, blue and black. For more photos and information, visit Alex’s great blog, PlayGroundology. Aerial Salamander Playground photo by Marc Cramer. All other photos by Alex Smith.